The book no one wants to write… the book everyone needs to read. I have read many books over the past 55 years, ranging from theological to history to biography to technical. Of all of them I would have put two books in the above category, until now. 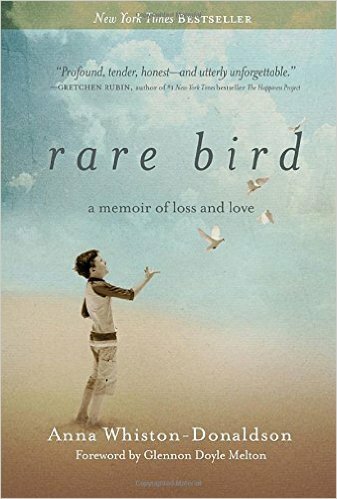 Now, the third one, Rare Bird by Anna Whiston-Donaldson (about her son’s death). This is a book about her son’s death and the family’s journey in the trail afterward. I had read her blog accounts over the past 4 years, getting bits and pieces of the story. Yet I did not have any further insights. This book covers the details of Jack’s death, and immediate reactions. But even more Anna reveals the depth of the loss and the path that she and her husband followed, and their daughter. Anna writes in such a way that she draws the reader to want to be at the river’s edge shouting for someone to help Jack, or Anna, or Margaret, or Tim… She reveals the torment, the futility, the “what-ifs” that inevitably arise in such circumstances. The tale of tragedy and the brokenness of life was gripping, and I wanted to read it all in one sitting. But I could not. The pain, the agony was too much. At one point I couldn’t read it for 5 days, it was too overwhelming for me. I can’t even imagine the days for Anna and the family. She couldn’t put Jack’s death and her life aside for even an hour, like I could with the book. Anna offers insights throughout a 2-3 year process of living with this. As a pastor I have seen people respond with love for the family when a death occurs, but often the continual support begins to wane after a few weeks or months. She doesn’t give us a short snapshot of this process. Because there is no short snapshot. Instead she walks the reader through the long path of grief. Anna also describes the changing nature of her grief, letting us see the depth of grief, but also the extent of the grief. Not very often do people learn about what she went through without having gone through the experience itself. Anna provides a flashlight through her own experience so that we can walk that path, yes, in a sense with her, but more importantly with someone close to us who is walking that path. We lost our son for many years, not through death, but through prison and then him going missing for 17 years. Many times in my own despair I thought, “If only it would end. The unknown is too difficult.” We grieved throughout that period. But after reading this book, I realize that even an end does not stop the hurting, the loss, the grieving. In another way, though, Anna helped me to realize something of our grief based on what she experienced. There were things, events, etc. we could not participate in or go to. Holidays, birthdays, anniversaries were not celebrated because the pain was too much. Sometimes people were constant reminders of what we lost. Anna describes this sense of loss so well. I also found that I could not share with many people what I was experiencing (it took many years for me to learn how to communicate), because I realized that many people didn’t understand, and sometimes what they said was hurtful (even though not intentionally). Anna also shares with the reader the sense of gratitude for those faithful people who stood by them in the darkest days, weeks, months, and yes, years. Loving, helpful people who sometimes just allowed her to cry. We experienced Christian friendship like that, too. When I was stationed in the Navy in 1974, my only uncle died at age 49. My grandmother was 64 at the time (two years younger than I am now). I remember standing beside the casket and she said, “No parent should ever have to bury her child.” That memory is clear to me today as it was 41 years ago. And Anna’s book is a monument to those words. And yet… my grandmother continued to live through that. And Anna has lived through this loss. This book is a book of loss, despair, anger, frustration, courage, and strength, all because of God. As Anna explored aspects of death and coming to grips with it, she shows to the reader, the winding path she is on, but ultimately the path which Jesus walked with her. This is a book of help and hope for everyone. It is memoir of loss and love, and the God who is present through it all. Thanks, Anna, for opening your heart on such a personal, deep level.